After a few days of waiting to find out who would be the Phillies’ World Series opponent, the Yankees sent the Angels back home, defeating them in Game 6 of the ALCS. I was kind of hoping they’d go to Game 7, so the winner would only have one day off, they’d be nice and tired, and hopefully CC would not be available the first game or so. No such luck. Nonetheless, destiny was fulfilled, and I will not have to hear those freakin’ thunder sticks booming out of my TV any more. So why do I say “destiny”? … So, for all of you fans out there that would really like to see the Yankees win the championship, keep your thoughts and feelings positive and in this way we can co-create a resonant field of success that energetically supports their win. It’s just quantum physics. So Jane, does this mean that if Jenn and I concentrate hard enough, we can get the Phillies back to the WS? A Phillies-Yankees series would be cool! Loved the article – it was really funny! Glad you liked the article, Sue. Yes, we must concentrate and we will “manifest” our guys to victory! A Yankees-Phillies WS would work for me. So you see, Jane and I already had it agreed way back in February, our teams would meet in the World Series. We never broached the topic of the outcome of the WS. I guess if we extrapolate from Patricia’s comments, the team whose fans put out the most positive thoughts will create the larger field of success, thereby leading that team to victory. This is a tall order for most Philadelphia sports fans – we’re just genetically programmed to expect the worst. So fellow Phans, I ask you – no, I command you – think positive! Concentrate! Let’s lead our team to victory in our minds, and they will follow on the field! The Phillies dropped their second exhibition game yesterday, losing to the Blue Jays 6-2. The good news from the game was that Carlos Carrasco and J.A. Happ each pitched two scoreless innings. Carrasco struck out three, without giving up any hits, and Happ struck out one while giving up one hit. So it looks like the competition for the fifth starters’ spot is already off to a blazing start. Um, Charlie, wouldn’t the other teams be in the same boat too? The Pirates’ and Blue Jays’ bats apparently aren’t so far behind. OK, I know these games don’t matter, etc. etc., and the runs have been given up not by the starting rotation guys, but by the non-roster invitees. But the Phils weren’t facing the other teams’ aces either, so let’s wake up those bats, please! Breaking news! The Phillies have released Adam Eaton. Looks like the team will end up eating $9 million on Eaton: $8.5 million for this season, plus a $500,000 club option for 2010. I’d still love to know why the front office thought that signing a pitcher whose ERA has never been below 4.00 was a good idea. For three years, no less! I will be interested to see if he ends up getting picked up by another team. Earlier this week, I finished reading Jane Heller’s book Confessions of a She-Fan. Keep in mind that I was only familiar with Jane from her MLBlog of the same name, and then only since the beginning of February when I started this blog. I was initially taken aback (slightly) by the true depth of Jane’s vitriol towards the Red Sox and their Nation. Of course, Jane can’t use some of the words directed at said players and fans here on the blogs without getting in trouble! Being neither a Yankees nor a Red Sox fan, I was able to enjoy the book without reliving the heartbreak of the 2007 season (for Yankees fans), or being offended (for Red Sox fans). In fact, quite a few times while reading I was laughing out loud, to the point that my husband or children were asking me what was so funny. I don’t want to give anything away here to any of you who haven’t read the book yet, so I won’t go into specifics, but suffice it to say that she-fans of any team will enjoy it! 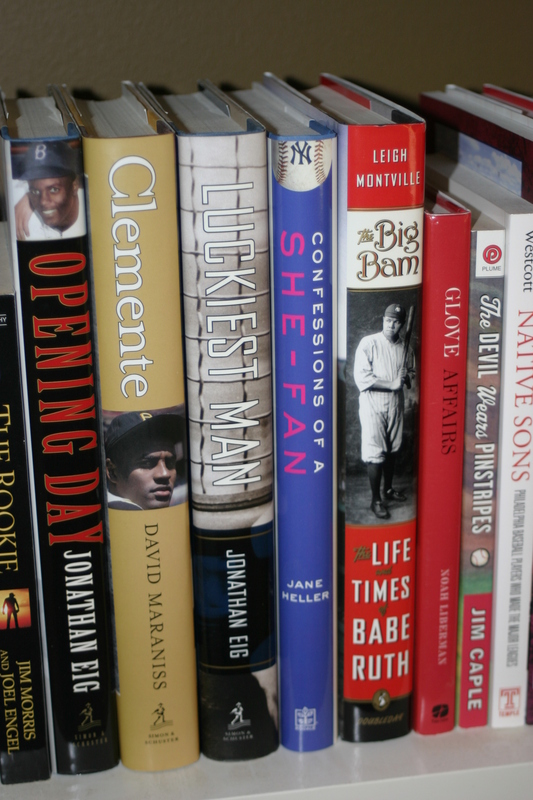 The book is more than just a recap of the Yankees’ 2007 season, and Jane’s experiences following the team across the country for the second half of that season. She deftly interweaves stories of her early years of Yankee love, and her personal life as well, into the week by week travelogues. Also woven into the mix are the various attempts by Jane to gain access to the pressbox and the team, and how she seems to be thwarted at every turn by one Jason Zillo, the Yankees’ media relations director. All she wants is to talk to just one Yankee! By the end of the book, any Yankee will do. My favorite parts of the story are like bookends – one at the beginning (in the prologue), when Jane sights A-Rod in a Toronto restaurant, and one near the end, when Jane ventures into enemy territory at Fenway Park. After having been told to be on her best behavior and not draw attention to herself as a Yankee fan, what Jane finally does at the end of the game is worthy of a You-Tube moment!